The Platinum Shield cover comes with a FREE storage bag and a FREE antenna patch. How Does This Platinum Shield Scooter Cover Compare with Our Other Covers? NEW Satin Quality Material! Satin Shield Scooter Covers provide top level INDOOR protection. Our softest, most luxurious material made for your garage kept vehicle. A satin-like stretchy material that is soft both inside and out. This cover is sure to please as it comes with our highest customer satisfaction rating of all covers! Our car covers will accommodate your mirrors without pocketing them. We've engineered them out of the design because mirror pockets are unnecessary and are usually the first part of a Scooter cover to deteriorate or rip. This ensures that you will get maximum durability from your Scooter cover! Yes! This cover is sized for your Scooter by the dimensions: length, width, and height (called semi-custom). Combine the perfect size with the elastic front and rear hems and you are getting a cover that is going to fit your vehicle extremely well. We're so confident that you'll love how our cover fits your vehicle that we will pay return shipping if you receive an incorrect cover! If you require a 100% made to order cover, we can do those as well but they are more expensive. Please give us a call if you would like more information. Quality of fabric is more important than quantity of layers. 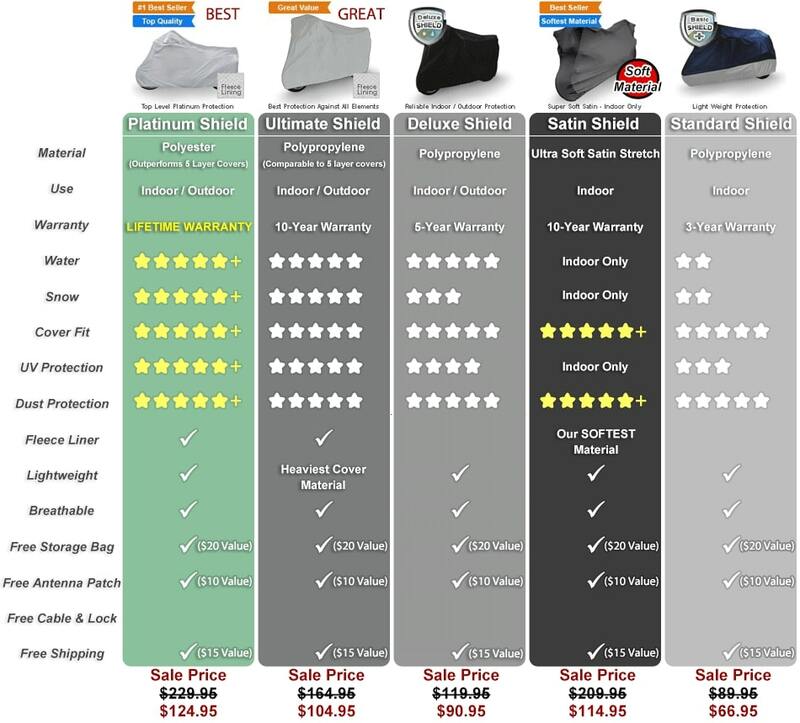 The Satin Shield, our best indoor cover, is not built upon a layering principle. It is a high quality satin stretch fabric. Lined with an ultra soft material, your Scooter's finish will be perfectly preserved and protected. I have modifications and attachments on my Scooter, what cover should I order? Our checkout page has a comment section. Simply order the cover for your Scooter and make as many detailed notes as possible about your Scooters modification. For example if you have saddle bags just state you have saddle bags. This will allow our warehouse team to grab the correct cover. How Does This Satin Shield Scooter Cover Compare with Our Other Covers? The Ultimate Shield cover comes with a FREE storage bag and a FREE antenna patch. How Does This Ultimate Shield Scooter Cover Compare with Our Other Covers? Deluxe Shield Scooter Covers are great outdoor and indoor covers. They offer amazing protection against rain, sun, dirt and other elements. Our scooter covers will accommodate your mirrors without pocketing them. We've engineered them out of the design because mirror pockets are unnecessary and are usually the first part of a scooter cover to deteriorate or rip. This ensures that you will get maximum durability from your scooter cover! Yes! This cover is sized for your scooter. Combine the perfect size with the elastic front and rear hems and you are getting a cover that is going to fit your scooter extremely well. I have modifications to my scooter, what cover should I order? Our checkout page has a comment section. Simply order the cover for your scooter and make as many detailed notes as possible about your modification. This will allow our warehouse team to grab the correct cover. How Does This Deluxe Shield Scooter Cover Compare with Our Other Covers? Standard Shield Scooter Covers are great for indoor and light outdoor use. They provide needed protection against dirt and dust! This is for basic protection at a great price. Will this fit my Scooter? How Does This Standard Shield Scooter Cover Compare with Our Other Covers?